← DIABETES Part A Identify, Deal With & Conquer: This is one of the most important Newsletters we’ve written (sorry it didn’t make it to the Blog sooner). It’s about conquering the #3 Killer of Americans, DIABETES! We are so happy to share the step by step account of the construction of our new Greenhouse. Like all of our projects, this one is taking longer and costing more than we expected; but this Greenhouse is going to be a beauty when it’s finished. And it’s going to work great, too. We’re not actually in the Greenhouse building business; so it took some real planning and research to come up with the design, which in many cases keeps evolving as we move through the process. on our Aquaponics USA website. Visit the Ocean Quest Website. Better yet, make an appointment to visit Discovery Cube’s Ocean Quest in person. If you’re a Teacher, bring eager, inquisitive students. (they are located on the sidebar). Here’s our January 2017 Newsletter in case you missed it. This is one of the most important Newsletters we’ve written in our Obesity In AMERICA Series because it’s all about the #3 Killer of Americans, Diabetes. And be sure to watch for our March 2017 Newsletter, which is Part B of this important health topic. We are postponing the follow up Parts B (and perhaps C) that will further delve into the battle with Diabetes to bring you important updates on our new Greenhouse construction project. Those of you who have been wondering when we were going to get back to Aquaponics will be happy to hear this; and we are overjoyed to see this Greenhouse construction project finally moving forward. So let’s talk about what we’re building here in the beautiful White Mountains of Arizona. We chose the house we bought precisely because it already had the perfect South facing space with a 15 ft. by 75 ft. concrete slab that we could turn into a Greenhouse. The photo below is what this space looked like last summer when we were using it as a patio for eating outdoors and just enjoying our beautiful view. Our cover photo shows patio furniture in the Greenhouse, but that won’t be the case. We brought the furniture inside because we’re expecting a big storm this weekend, February 25, 2017; and now our Greenhouse is water tight (except for the West end). The open space in the background of this combination photo had a covered roof that kept the sun out during a lot of the day. That will be the actual growing area for all the veggies and fruits we’ll be growing. The space in the foreground is going to be our Fishroom, and we can’t wait to have Tilapia swimming around in their Fish Tanks along side our water filtration system, our sump tank, our heating system and other needed equipment. We placed a photo blow up in the foreground of this picture to show the plastic from Germany that we used to enclose our Greenhouse. It’s multiple layered with an insulating bubble in the middle, and it’s super strong and durable. We’re sharing a play by play account of how we turned this covered porch into a Greenhouse. 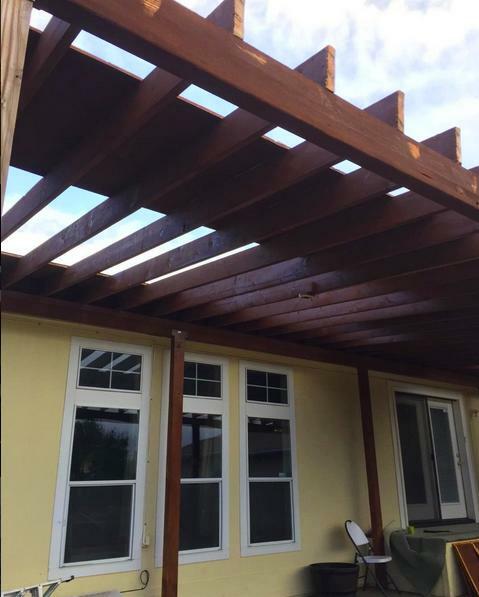 This is a pretty standard porch design, and a lot of homes have them so we want to share our project with all of the people who are looking to built Greenhouses as inexpensively as possible. The big plus here is the slab was already in place and the porch FACES SOUTH. We are building a variation on what is known as a Chinese Solar Greenhouse. This proves that sometimes modern technology isn’t necessarily the best solution to an age-old problem. It just so happens that our Greenhouse in California, even though it was polycarbonate on all four sides, was also a variation on a Chinese Solar Greenhouse because only the South side received sunlight. Once we figured out what was actually going on inside our Greenhouse, we covered the North side with thermal covering to insulate it and help the Greenhouse retain heat. As part of the R&D we were doing at the time to determine the most efficient way to grow lettuce, our System Designer, Oliver Duffy, designed this 75 degree lettuce wall utilizing 3/4ths of our Greenhouse to put out over 200 heads of quality lettuce a month in 8’x18′ of this Greenhouse. In the back, we had two Deep Media Grow Beds growing tomatoes. Below is the incredible result we got once we maximized our variation of the Chinese Solar Greenhouse. Our new Greenhouse is actually called a Passive Solar Greenhouse. The North Wall of our Greenhouse is our actual house so that wall is obviously not made of brick. It does have insulation and windows that will be looking into the Greenhouse. We’ve already painted this North Wall bright white; but have decided to also cover it with the same silver insulated covering that we used on our California Greenhouse for added thermal protection, protection of our house wall and light reflection. In this photo you see Keil Plotczyk our new Aquaponics USA Partner and our Independent Contractor who is an incredible tradesman with multiple skills and Dan Hall (behind Keil) another highly skilled tradesman. Together with lots of input from our System Designer, Oliver, they are building this Greenhouse. Keil and Dan are beginning the construction of the East Wall, which will close the new Fishroom off from the outside. Here’s a step by step description of how this project is going. The first thing we had to do was remove the sun roof. You’ll notice that we left the supporting rafters so they would serve to support the Greenhouse covering. Then we trimmed off the eaves of the supporting rafters so the Greenhouse covering could be pulled snugly over them and secured to the front beam. In the top photo, Dan is cutting off the eaves. Right after completing this part of the project, the whole project went on hold for several days due to a big snow storm. We actually had snow trying to come into our front door because it was piling up on the porch. Once we dug ourselves out from under the snow, we installed the first sheet of Greenhouse covering. Seeing that first sheet of Greenhouse covering go up was a milestone accomplishment. It also looked great because this Greenhouse covering called “SolaWrap” is really unique. It comes with plastic strips that hold the 6ft. wide sheets on each side making for a sleek, taut look. As weather permitted (we had to have snow and wind-free weather) our crew installed the SolaWrap across the front and the roof of our Greenhouse. On the left side of this photo, you can see the first sheet of SolaWrap that was laid on the roof. The YouTube Video below describes the great features that come with this incredible German product. Above, you are looking at the outside of the new East Wall, which is now in place. The holes will have louvered windows for air flow through and out of the Greenhouse and Fishroom. This is a solid wall that has not been designed for sunlight as the Fishroom on the other side is a fully enclosed, roofed room. Above is the inside of the new East Wall. It is fully insulated to control both heat and cold climate conditions. Below is the finished inside of this wall still waiting for the trim, the door and those louvered windows. We are now starting construction of the West Wall. Because this is the side of the Greenhouse where the sun sets, we get a lot of afternoon light here so this will not be a fully solid wall. The lower 5 ft. will be solid with holes for our two swamp coolers, but the top of this wall will be covered with SolaWrap to allow in light. Come back in March to see how this wall turns out. For the final shot of our Greenhouse project, here’s a picture of the rain gutter that was recently put in place. It serves a dual purpose. First it catches all the rain we will be dealing with here in the White Mountains as this is Monsoon country, and we get both winter and summer rains. But it also serves to hold down the front overlapping SolaWrap that extends from the roof pieces and wraps over the eaves. We hope this play by play of our Greenhouse construction project has been helpful for any of you who are ready to start growing your own food and have a porch that can be converted. While all this Construction is going on, we’re conducting business as usual. Here’s a truck load of components that will be making up a STEM Food Growing System for Ms. Marcy Lane Harris’ Intermediate Math Class in the Duncan Unified School District of Arizona. Marcy was able to save the money it costs to ship one of our STEM Food Growing Systems by picking it up herself. Below is a photo of the 18 Wheeler that very carefully backed all the way up to our workshop to pick up a STEM Food Growing System that went to Pennsylvania recently. STEM Teachers, be sure to check out the STEM Education Coalition Newsletter and Website. “The STEM Education Coalition works aggressively to raise awareness in Congress, the Administration, and other organizations about the critical role that STEM education plays in enabling the U.S. to remain the economic and technological leader of the global marketplace of the 21st century.” (Quote taken from the STEM Education website About Page entitled Our Purpose) This Newsletter comes out every Monday. And this next Monday, February 27th, our first article under the Title “We Send Schools of Fish to Schools!” will be appearing in their Newsletter about our STEM Food Growing Systems. We’ve written an exclusive 3-Part Series for the STEM Education Coalition Newsletter featuring three schools that are running our STEM Food Growing Systems. These are fascinating, motivating and heart-warming stories about what’s happening in schools that have STEM Food Growing Systems. Part 2 of the Series comes out March 6th, and Part 3 of the Series comes out March 13th. We can’t wait to share these stories with Teachers across the country. You can follow the progress of our new Greenhouse Construction in every Newsletter from here until this project is complete. It’s going to get real interesting when we install our Food Forever™ Micro Farm. On-Site Aquaponics USA Classes Are Coming Soon! We’ve added “Classes” to our Menu Bar at the top of every page. Right now, the above Announcement is all you will see; but we’ll be posting a fully detailed page soon with Dates, Times Pricing and Content. We plan to begin these Classes this summer and would love to have you in attendance. In many ways and especially when it comes to Big Food, we are all David of David and Goliath–little men fighting the big, rigged cog controlled by huge corporations that are in bed with government. The best thing we can do to fight this behemoth is to learn to GROW OUR OWN FOOD! Please FORWARD this email to your colleagues, friends and family whom you believe may be ready to become more Food Independent. Thank You for following our Newsletters. We so appreciate your interest in our two cutting edge Aquaponics Companies, Aquaponics USA, LLC and Aquaponics World, LLC. We’ll continue to bring you important information about Aquaponics, our Food and our U.S. Food System, which, right now, is broken and has turned us into subjects of the Big Food Sharks and the Biotechs. Offer Ends March 25th at Midnight!